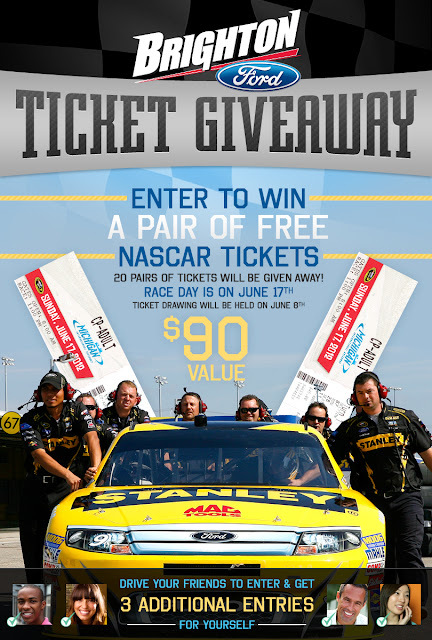 BRIGHTON, Mich. May 16, 2012 – We love to spoil our Facebook fans and this time we are giving away 20 pairs of tickets to the NASCAR race on June 17th at the Michigan International Speedway. All you have to do is follow this link to Enter the Contest. Want to better your odds of winning? Share this opportunity with your friends! You will get 3 ADDITONAL entries for every friend that enters the Giveaway. The drawing will be held on June 8th. Winners will be contacted via the email that you provide when you enter the contest. If you are selected as a winner you will need to stop by the dealership by Monday June 11th to claim your prize, otherwise we will have to draw a different winner. If you wish to review the full contest rules, you can find them on our Facebook Events Page. Don’t miss out on this FREE opportunity to enjoy a fun filled day at MIS and cheer on the Ford Racing team! If you have any questions, please feel free to Contact Us, we would be more than happy to help you. Be sure to check out our great selection of New Ford Vehicles and our outstanding selection of quality Used Vehicles.